BASIC Stamp: An Introduction to Microcontrollers introduces microcontroller theory using the Parallax BASIC Stamp I, II, and IIsx. The BASIC Stamp microcontroller is based on Microchip's PIC hardware with some modifications and is very approachable for beginning users. Once the basic theory is established, BASIC Stamp, 2/E walks the reader through applications suitable for designers as well as the home hobbyist. These applications can be used as is or as a basis for further modifications to suit specific design needs. 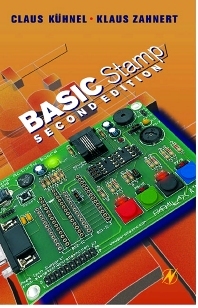 BASIC Stamp, 2/E thoroughly explains the hardware base of the BASIC Stamp microcontroller including internal architecture, the peripheral functions, as well as providing the technical data sheets for each kind of chip. The authors also explain the BASIC Stamp development systems including DOS and Windows-based tools in tremendous detail. As an added feature, BASIC Stamp, 2/E includes full instructions for using PBASIC programming and formatting. The book provides many specific applications for microcontroller use, complete with programming instructions, including: single instructions, multiple instructions, interfacing directions, and more complex applications such as motion detection, light measurement, and home automation. Dr. Claus Kühnel is the Engineering Manager for Multanova AG, in Switzerland. He is a member of the IEEE, and has a strong background in microcontroller design. Dr. Kühnel has written books and articles for the German and Swiss electronics markets. Dr. Klaus Zahnert is a retired measurement systems designer, and an active electronics hobbyist. He writes books and articles for the German electronics market.